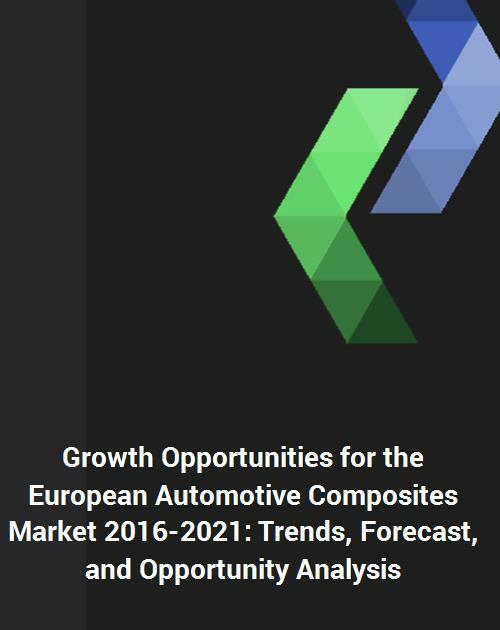 Growth Opportunities for the European Automotive Composites Market: Trends, opportunities and forecast in this market to 2021 by material type (SMC, BMC, GMT, SFT, LFT, CFT, phenolic, PU, natural fiber, and other composites), by resin composites type (PP, PBT, vinyl ester, PA, epoxy, polyester, phenolic and others), by fiber type (glass fiber, carbon fiber and natural fiber composites), by resin group (thermoplastic and thermoset composites), by application (interior, exterior, power train system, under body system, electrical and electronics, nd others) and by country (Germany, France, UK, Spain, Italy, and Others. The future of the European automotive composites market looks good with growth opportunities in various applications exterior, interior, power train system, chassis system, under body system, and others. The European automotive composites market is expected to reach an estimated $4.1 billion by 2021 and it is forecast to grow at a CAGR of 5.8% from 2016 to 2021. The major drivers of growth for this market are increasing automotive production and increasing demand for lightweight materials to achieve higher fuel efficiency and reduce greenhouse gas emissions. European Union has set new standards requiring passenger cars need to meet a CO2 emissions target of 95 g/km (equivalent to 57.9 mpg) by 2021, and for light commercial vehicles it is 147 g/km (equivalent to 43.3 mpg) by 2020. The European commission proposal to improve European fuel economy standards serves as a major stimulus to incorporate lightweight materials including composites. Emerging trends, which have a direct impact on the dynamics of the industry, include increasing penetration of thermoplastic and carbon composites. Another emerging trend is the formation of strategic alliances between OEMs and carbon fiber and resin suppliers in the automotive industry. A total of 83 figures / charts and 30 tables are provided in this 141-page report to help in your business decisions. Sample figures with some insights are shown below. Plastic omnium, Polytec, BASF, DSM, Polynt, Lanxess and Hanwha are among the major suppliers of composites in the European automotive market. On the basis of its comprehensive research, the author forecasts that natural fiber composites are expected to show highest growth; however, SFT composites are expected to remain the largest market during the forecast period of 2016 to 2021. Within the European automotive composites market, polypropylene (PP) composites, polybutylene terephthalate (PBT) composites, polyamide (PA) composites, vinyl ester composites, polyester composites, phenolic composites, and others are the major resin type segments. PP composites are expected to remain the largest market by value and volume consumption. High resistance to abrasion, low friction characteristics, electrical resistance, heat resistance, and good chemical resistance are the properties which drive the demand for PA composites in automotive. By fiber composites, glass fiber composites market is expected to remain the largest fiber segment; the carbon fiber composites market is expected to witness highest growth over the forecast period. Increasing penetration of carbon composites in sports, luxury and electrical vehicles are the major drivers for usage in automotive market. Q.1. What are some of the most promising, high-growth trends in the European automotive composites market by material type (SMC, BMC, GMT, SFT, LFT, CFT, Phenolic, PU, Natural Fiber, and other composites), by resin composites type (PP, PBT, Vinyl Ester, PA, Epoxy, Polyester, Phenolic and others), by fiber type (glass fiber, carbon fiber and natural fiber composites), by resin group (thermoplastic and thermoset Composites), by application (interior, exterior, power train system, under body system, electrical and electronics, and others) and by country ( Germany, France, UK, Spain, Italy, and Others? Q.2. Which product segments will grow at a faster pace and why? Q.3. What are the key factors affecting market dynamics? What are the drivers and challenges in the market? Q.4. What are the business risks and competitive threats in this market? Q.5. What are the emerging trends in this market and reasons behind them? Q.6. What are the changing demands of customers in the market? Q.7. What are the new developments in the market and which companies are leading these developments? Q.8. Who are the major players in this market? What strategic initiatives are being implemented by key players for business growth? Q.9. What are some of the competitive products in this area and how great a threat do they pose for loss of market share through product substitution? Q.10. What M & A activities have transpired in the last 5 years in this market?